Saturday arrived and it was stupid cold on the way to Mustang Maniac, my breath was leaving a mist in front of me as I walked to the car. The sky looked heavy, but I was going to enjoy myself regardless. I arrived after battling through flurries of snow that luckily didn’t settle for too long. As I arrived I was told that a full English breakfast down the local pub was the order of the day to warm us up. Adam kindly treated us all to breakfast. Thank You Adam. We arrived back all warmed up and I was eager to get on with my tasks for the day. Yogi told me what needed to be done, dash pad, brake booster with the brake pedal box fitted inside and throttle link. I was happy apart from the cold. First job was the dash pad, a thick lining that was attached to the inside of the car to stop the noise of the engine and insulate the inside of the car. The solid pad had cut out holes that were removed depending on the configuration of the car. Things like heater box and heater pipes, wire looms needed to go from the inside to the outside. The pad had to be tacked in place with large plastic studs and align the holes correctly. You can also stick the pad down, but as I may need to move bits about to fit them, I will leave that sticky bit till last after all the fire wall fittings have been made. 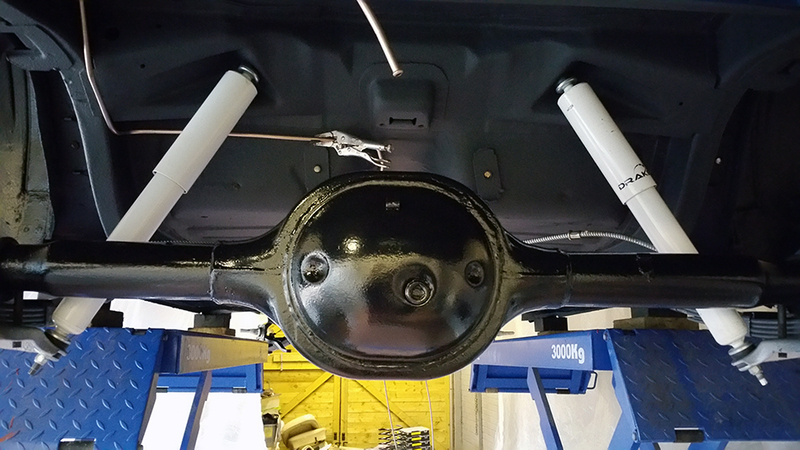 The next job was the brackets for the brake booster that bolted to the inside the of the car. It sort of goes without saying this was really a two-man job to hold in place while the first couple of bolts held it all together. But, I found out that if you put your hand through the steering column hole you can hold the inside pedal box and bolt the brackets on enough to hold them in place while you do them up tight. The throttle pedal link was a simple three screws through the firewall. My designated jobs were done, but I was eager for more. Adam turned up just at the right time to see how I was getting on. We had a discussion about the next jobs and he decided that the heater box and steering box could be fitted. Both of these were two-man jobs and Adam stayed to help me with it all. We fitted the heater hoses first the heater box so we didn’t have to fiddle around inside the car at a later date. The end result for the day was a nice looking bit of work so far. The only trouble is that the work took longer than I expected so there aren’t too many pictures to show, but you can see the end results. The photo I forgot to post last week was the shocks fitted in place, so here elusive picture is. Next week we might be in a position to put the engine in the car! This entry was posted in Car, Photo's and tagged Dash pad, heater box, Mustang, Mustang Maniac, One man and his Mustang, shock absorber, snow, steering box, steering column. Bookmark the permalink. Looking great. I can’t wait to see the engine going in!